This property is a true gem. Nestled in a quiet community just to the south of the Kingsway, this property is extremely well located. 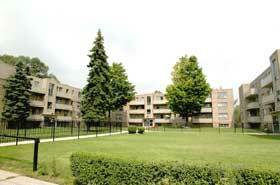 It is only a 15 minute drive to Downtown Toronto, with easy access to the QEW, Gardiner Expressway and Highway 427. TTC service is only steps away. The setting is beautiful as well. Located on spacious grounds, this property backs onto the Humber River Trails and boasts spectacular views of the Humber River and its lush vegetation. The Trails’ network of walking and biking paths, as well as its close proximity to Lake Ontario, make outdoor recreation part of your life in this special community. In addition, down the block from this community is a mall that will take care of your shopping needs. The mall includes a supermarket, dry cleaner, video store, pharmacy and restaurants. This community is also conveniently located to a day care center, schools, movie theatres and a medical center. Our residents also enjoy the building itself. The building is extremely clean and well-maintained. The building features controlled access, laundry facilities and outdoor parking. Many of the suites are newly renovated and include plenty of kitchen cabinet space, modern appliances, hardwood floors and ceramic tiled bathrooms. The suites also have balconies/patios, plenty of closet space and are cable ready. One of the most important features of this property is our on-site staff. They are friendly, receptive to residents’ concerns and work with our residents so that they can enjoy their homes to the fullest. So come and join the Humber River Apartments family. You won’t be disappointed.